Elizabeth Suchy has extensive experience in the areas of commercial and residential zoning and land use development, including inland wetlands and watercourses matters, primarily on projects in Norwalk, Connecticut. She has handled numerous real estate projects for major national retail and residential developers and private property owners in Norwalk, New Canaan and Orange, Connecticut including office buildings, single- and multi-family residential projects, subdivisions, commercial structures and municipal power generating plants, regularly representing clients before municipal Planning Commissions, Zoning Commissions, Zoning Boards of Appeals and Inland Wetlands and Watercourses Commissions. 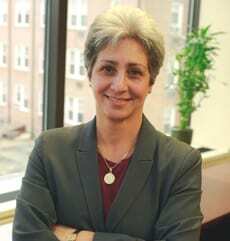 She has also represented numerous individuals and businesses seeking to obtain liquor permits from the State of Connecticut.